The white flowers of the bridal wreath spirea becomes a starry background to the dangling pink bleeding heart blossoms. Please note that any text that is coloured is linked to another page on this website or another. Some of the pictures are linked to other websites. Starting the garden off right in spring is worth the effort. Discover techniques for pest management, fertilizing, composting and watering, all without chemicals. Seating is limited. Job Postings to post a position. Peppermint Stick tulips and checkered lilies (Fritillaria meleagris). I am far behind in my gardening chores because we've had a odd spring. Instead of getting the garden ready in February and March, I was protecting my camellia and other early flowering plants from below freezing temps and dumps of heavy snow. British Columbia gardeners were outraged! How dare the weather be so… Canadian! But then the sunshine and the heat came, an no rain. Are we still in BC? We need the rain, not just to help the plants, but to prevent an early start on the irrigation restrictions, and then there is the issue of forest fires. With that said, I hope we don’t get swept away with April rains. So because spring was late and broke all kinds of records from being too cold, too hot, too dry and let’s not forget about all that snow, gardeners are scrambling to make up for lost time. It is turning out to be a lovely spring and it is my favorite season. There are so many gorgeous flowers takes my breath away. Nature is all abuzz and birdsong fills the air. The sun warms my soul and my fingernails are dirty once again. A deep purple poppy anemone (Anemone coronaria) and yellow wallflowers (Erysimum cheiri). If getting your garden ready for growing seems a bit daunting, and you don't know where to start, Amanda will show you how. Want help on how to create a vegetable garden? Want to grow from seed, but don't know how? Need help trying to figure out how to get the garden ready for spring? Is your garden not functioning the way you want? Get Amanda to teach you the ropes in your own garden by making an appointment here. An aptly named Horned Tulip, Tulipa acuminata (turcica). Eddie's White Wonder dogwood, deciduous tree, sun, part shade, 20-30ft x 20ft, Zones 7 to 9. 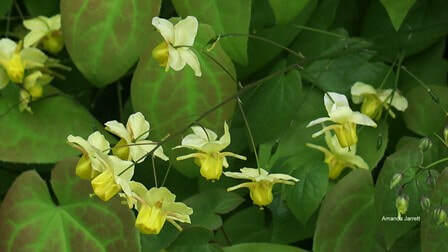 Bishop's Hat (Epimedium × versicolor 'Sulphureum') is a good evergreen groundcover for shade. 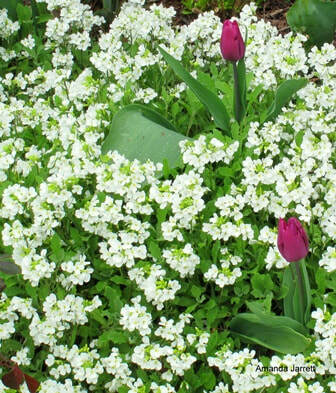 A white flowered aubretia, Aubretia deltoidea, low spreading evergreen ground cover, sun to part shade, Zones 4 to 9. And Purple Prince tulips. Lake Lolog Barberry (Berberis x lologensis), broadleaf evergreen shrub, deer resistant, sun to part shade, edible fruit, 8ft x 8ft. Zones 5 to 9. Shooting star, Dodecatheon pulchellum, herbacous perennial, up to 12" when in flower, indigenous to Western North America, Zone 4 to 7. 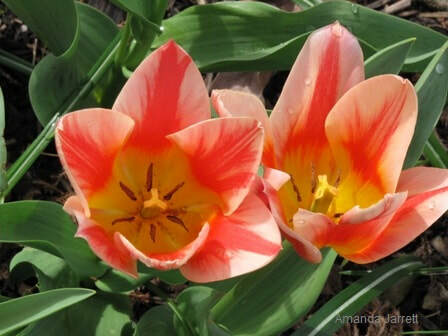 Quebec, Greigii tulip, spring bulb, multi-flowered, 3-5 flowers/bulb, 12", naturalizes, sun, Zones 3 to 8. 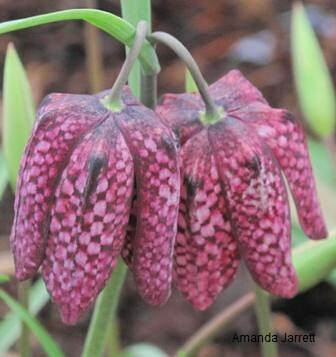 Checkered lily (Fritillaria meleagris), spring bulb, to 1 ft, sun to part shade, deer tolerant, Zones 3 to 8. To post your event here click here. 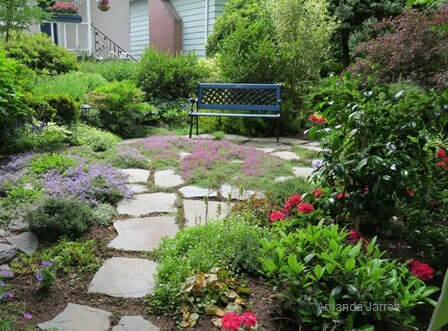 One of the featured gardens in last year's Heritage Vancouver Garden Tour. This fundraiser for the Dunbar Garden club not only offers plants there's garden books, magazine, tools and baked goods. All types of plants at reasonable prices are for sale as well as refurbished garden tools. Guest speakers are from the South Burnaby Garden Club. Lady's mantle (Achillea mollis) and grape hyacinths (Muscari armeniacum) provide an attractive ground cover for a semi-shaded. This wallflower (Erysimum), suffered from winterkill but still survived the ordeal. Once the danger of frost passed, the dead growth was cut off and the plant grew new foliage. 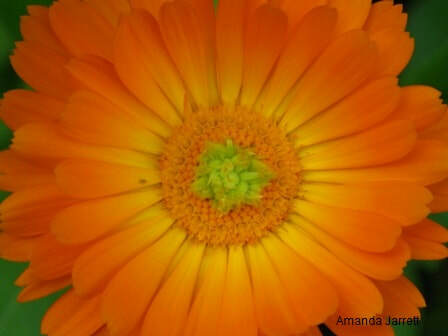 Scotch marigolds, Calendula officinalis, are suitable to sow outside this month. The timing of planting veggies and bedding plants depends on where you live in the world. 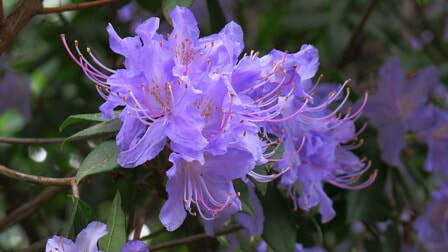 If in doubt of which plants to purchase and plant now, read plant labels and ask the nursery staff. In the temperate south of British Columbia, plant tomatoes, peppers, eggplants, petunias, begonias and other warm season plants in late April at the earliest. For the rest of the Canada wait until mid-May. Broccoli, kale, chard, sweet peas, alyssum, snapdragons and other cool season transplants can be planted this month, as long as they have been hardened off (see below). For sowing seeds outdoors, see below. Plant nurseries and garden centers are full of all kinds of lovely plants, but it is a month too early to plant tomatoes, peppers, melons, cucumbers and other warm season veggies outside. Same thing goes for warm tender bedding plants such as petunias, impatiens and coleus. With that said, it is a good idea to purchase them now. If you leave it too late, plant selection may not be as good. Store them in a protected area, away from frost in bright light and don’t forget to water them. These mature seedlings can either repotted into their own 2" pots or planted in the garden 'as-is', after they have been hardened off. Seeds started in February and March should be ready to put into their own individual pots by now. Once seedlings develop two to three sets of true leaves transplant each one into their own 2 inch pots. Use potting soil, not garden soil. After about 3 to 4 weeks (maybe less, maybe more depending on the plant and the conditions), roots should be well established with adequate leaves and stems to be prepare them for the outside world. Before planting outside, plants must be acclimatized. This process is referred to as hardening off. Set plants outside for an hour in a shaded protected spot. Each day thereafter, increase their time outside by an hour or so, their light and wind exposure until they are outside all day and night. Check on them often during this process to make sure they are not suffering and have adequate water. They will let you know they are unhappy. These seedlings have been repotted in individual pots and are being hardened off before being planted in the garden. Broccoli seedlings don't mind April's cool weather. Flowering daffodils indicate the soil has warmed and it isn't too soggy. It's time to sow broccoli, spinach and other cool season crops in the garden. Seed packets indicate whether or not the seeds should be sown indoors, outdoors or both. Water garden beds a day before planting if the soil is dry. Suitable plants to start outside are listed below. Vegetables: arugula, broad (fava) beans, beets, broccoli, cabbage, carrots, cauliflower, celery, chard, collards, endive, fennel, garlic, kale, kohlrabi, leeks, lettuce, onion sets, pac and bok choi, parsley, parsnips, peas, seed potatoes, radicchio, radishes, scallions, spinach, turnips. Herbs: borage, chives, cilantro, dill, fennel, garlic cloves. 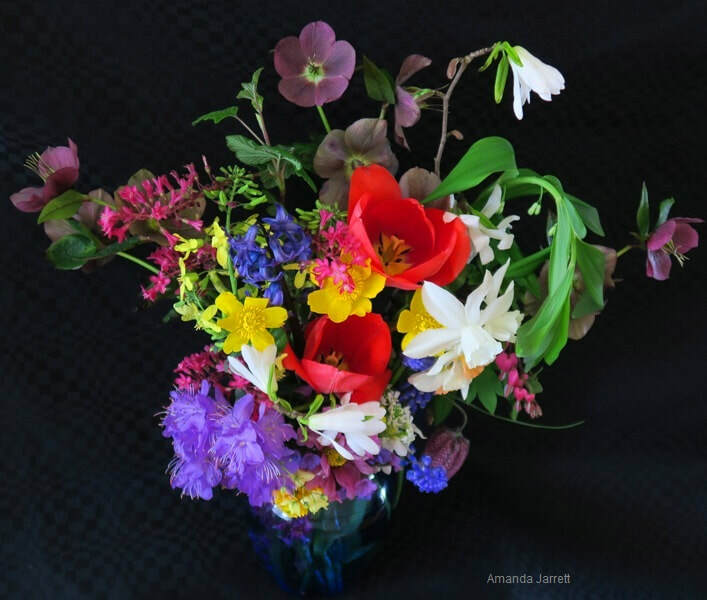 Flowers: calendula, cleome, cosmos, foxgloves, marigolds, nasturtiums, poppies, sweet peas, sunflowers. For more information on direct sowing click here. 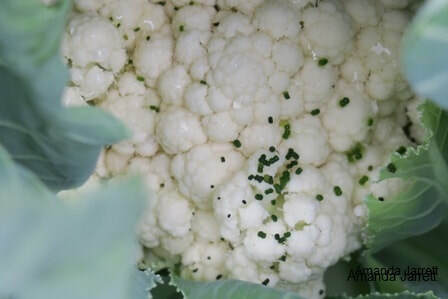 For more on Growing Vegetables click here. 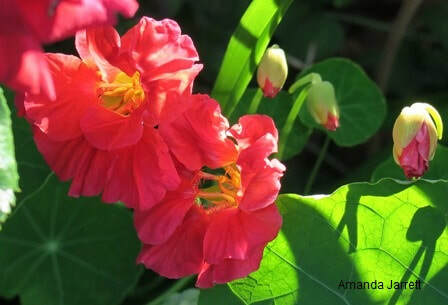 Dwarf Cherry Rose nasturtium can be sown inside or outside this month. Seeds that grow quickly can be sown indoors this month. Some of them can also be planted outside (read seed packets for recommendations), but to avoid slugs, cutworms and other seedling predators, starting them inside is a good idea. It gives them a head start and by the time it's safe to plant them outside in May, they are way ahead of the game and fighting fit to thwart plant pests. These include: sunflowers, cucumbers, squash, melons, beans, nasturtiums, sweet peas, calendula, marigolds, lavatera and peas. For more on Sowing Seeds Indoors click here. It's easier to sow carrot seeds, which are tiny, when they are mixed with larger radish seeds. Before planting, mix into the soil a few inches of compost, SeaSoil, composted steer or sheep manure. For more on soil improvement click here. Plant broccoli, lettuce, kale, cabbage, cauliflower and other cool season crops as transplants outside. Directly sow seeds outside of radish, carrots, peas, leeks as well as onion sets and garlic cloves. Click here for more on Direct Sowing. Plant seed potatoes. Click here for more info. Wait until next month to plant warm season crops: tomatoes, peppers, melons, cucumbers or start them inside as indicated above. To learn more about Vegetable Gardening click here. To learn about Crop Rotation, Companion Planting and Crop Succession, click here. Core aeration removes plugs of soil so air and water can penetrate to grass roots. Work on the lawn before summer arrives if you want a healthier, greener and stronger lawn and less weeds, moss and chafer beetles, leatherjackets and other root eating grubs. If you want a nice lawn here are the basic tips. You may not like them, especially the extra mowing, but give it a go. By the end of the year, you should an improvement. It may not be perfect, but it will be better. Lime: use Dololpril a slow acting, coated product, and follow rates according to instructions. Aerate: with a core aerator. Hire someone to do this; it’s hard work. Reseed: use correct seed for conditions: sun or shade, select one with fertilizer included and follow instructions. Moss killer: there are granular and liquid forms, follow the instructions. Mow: Set the mower at 3 inches, only take off a third of the grass blades at each mowing. Leave the clippings: mow often so clippings don’t clump on top of the grass. Water: water in the summer, don’t allow lawn to become drought stressed. Microclover is getting good reviews as a lawn alternative. ​If growing a lawn is not your cup of tea, there are options, especially if only one area of the lawn is just not working, no matter what you do. It could be too wet, too dry, nutrient poor soil, compacted soil. Whatever the reason, hardscaping such as a patio area would be a useful addition. Raised beds is another option, so are planters, or just convert the sad lawn into a garden. There are many plants that love the conditions that hinders grass from growing. There’s no need to rip up the existing lawn, just make the bed on top with the lasagna gardening method. To learn more click here. If you’d rather have an expanse of green you can walk on, how about microclover? This wee version of clover is cuter than regular clover. How about planting a meadow? Meadow gardens are becoming increasingly popular and rightly so. Like the microclover they provide food for pollinating insects and when done well, they look marvelous. Just weave a path or two through ornamental grasses, herbaceous perennials and wildflowers. 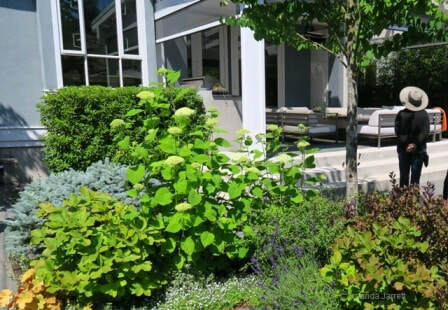 Or convert the lawn into a garden with shrubs, small trees, perennials and food plants: blueberries, strawberries, dwarf fruit trees, grapes, herbs and veggies. Who needs a lawn? This front garden is full of lush plants, including creeping thyme between the flagstones at the foot of a conveniently placed bench. Retrieve finished compost at the bottom of the compost bin and spread it around the garden. ​If you have a compost bin and haven’t got round to tending to it yet, here’s some pointers to get it back into shape for the growing season. Before adding more garden and kitchen debris, take the top non decayed layers off and retrieve the good compost from below. Spread the finished compost in the garden. Replace the uncomposted material back into the compost bin to start again as it adds beneficial bacteria and fungi that will help ‘seed’ the next batch. Add water if it is dry as nothing happens without water. It should be moist but not drenched. To learn more about composting, click here. Flowering currant, Ribes sanguineum flowers profusely this month. Walking the Garden: Daily or every other day walks through the garden is not just good for the soul, it also alerts you to potential issues. Although you might not want to look at the weeds and such, it is a good idea to snip things in the bud, so to speak. Spring Bulbs: Allow the leaves of bulbs to yellow and die before removing them as green leaves provide food for next year’s flowers. 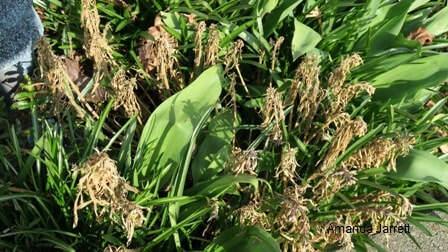 Do remove their spent flowers asap so they don’t develop into seed heads, which is a waste of the plant’s energy. Compost: Don’t forget to check your compost. Aerate and add water if necessary. Add finished compost to garden beds. Need colour? Want more flowers? Get thee to a garden center and select some flora for lackluster planters and boring gardens. There are some lovely things out there. Buying Plants: When purchasing plants, read the labels for sun preference, height, width and growing conditions. Watch out for cute little plants that grow into huge adults. Mulch garden beds with 3 inches of an organic mulch on top of soil and around plants. Frost: Hopefully frost nights are a thing of the past, but keep your eye on the temps just in case, especially newly planted seedlings. That includes cool season crops: cabbage, kale and especially if they are just seedlings and transplants. Protect the babies. It's usually safe to plant outside when daffodils flowers. 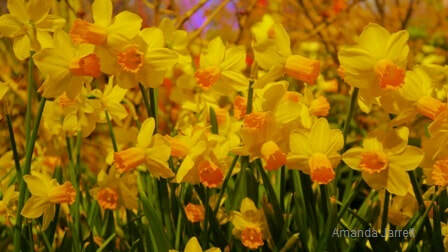 Wait for daffodils to flower and the soil to dry out before planting. A handful of soil shouldn’t drip when squeezed. Plant trees, shrubs, herbaceous perennials including lilies, callas, gladiolus iris etc. asap before it gets to hot and dry. Give them a good drink the day before. If the soil in their new home is dry, water it the day before also. Plant dahlias when the danger of frost has past, or pot them up and place in a frost free area. Wait to plant petunias, impatiens and other bedding plants (annuals) next month. Plant hanging baskets and containers. Be attentive to plants after planting so don’t go on vacation and check on them daily. To learn more about planting, click here. Cloudy dry days are the best days to plant. Cool, cloudy days are better than hot, sunny days. Avoid rainy days. It spreads diseases, fungi and compacts the soil. Plant so the crown of the plant (where stem and roots meet) are level with the soil surface. Loosen the roots before planting. If the roots are too potbound, use a knife to cut slits into the rootball. Add bonemeal to the hole or mycorrhizal fungi onto the roots before planting according to the instructions. Don't use both together as the bone meal hinders the fungi. Water well after planting, don’t rely on wet soil and rain. To learn more about Planting Know How click here. Suckers emerge from a branch stub. With a pruning saw, remove the stub and any remaining suckers. The best time to prune most plants is just after flowering. There is no need to prune all plants in spring. 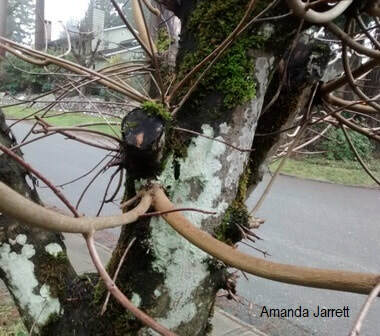 Always remove dead, diseased branches any time of year. Cut off suckers and watersprouts. Don’t remove more than ¼ of growth from a plant at one time. If there are any stubs from previous incorrect pruning, remove them at their base. For more on Pruning click here. If you need instructions for pruning in your garden, click here to make an appointment. Jubilee Celebration, a David Austin rose. ​Once rose canes start to produce leafy buds and forsythias go into bloom it’s rose pruning time. Cut back rose all canes by 1/3rd. Remove all dead, spindly, broken, diseased as well as old unproductive stems. Cut off canes that grow towards the plant’s centre and those that are crossing. Since roses are heavy feeders, place a few inches of compost, SeaSoil, well-rotted manure on top of the soil around the roses bush. 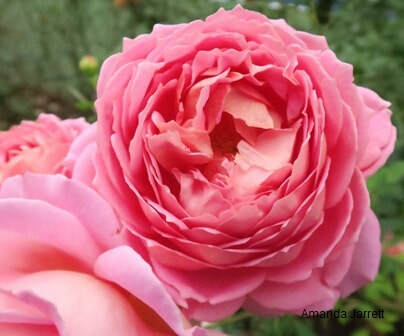 For more on pruning Roses click here. Growing roses click here. Rose Insects & Diseases click here. Rose Types click here. 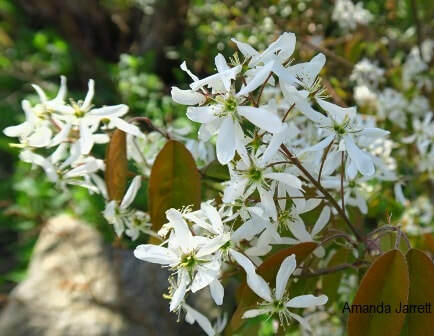 Register here for Amanda to come to your garden to teach you how and what to prune. Remove flower heads before they turn into seeds. 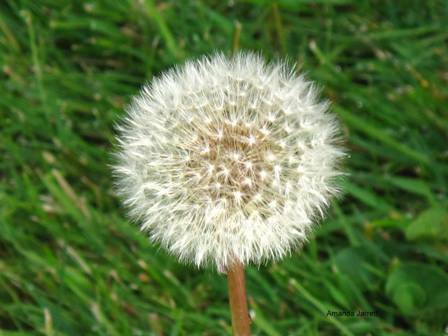 Don’t let weeds flower and go to seed: hand weed or at least cut off the flowers. To stop weed seeds from germinating (all and any seeds), apply corn gluten. Horsetails, morning glories (bindweed) and weeds with underground stems peak out of the ground, pull them out, don’t dig them out as it spreads them even faster. For more click here. 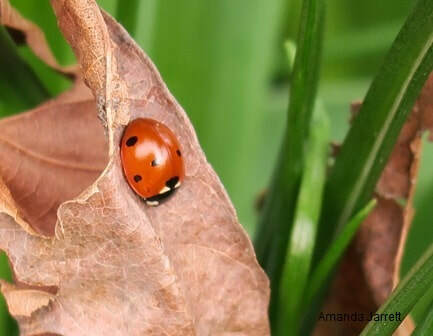 A lady bug is no vegetarian as it devours aphids! ​Bugs in the garden are a fact of life and totally natural, but when insects devour plants, something is out of whack. Incorrect growing conditions: too much sun or not enough are common reasons. So is bad drainage and too much nitrogen as it encourages new tender growth, which is a beacon to aphids. To top it off, it’s spring and plants are covered with delicate leaves and buds. Slugs and caterpillars also get into the act. It’s a veritable smorgasbord out there! Avoid spraying plants as it kills the good guys too. Handpick caterpillars and slugs. Squish aphids and/or hose them off. Prevent insects from coming into contact with plants by using barriers. 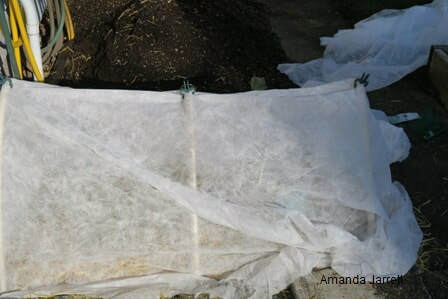 Floating row covers (cloches) made of spun bonded polyester protect plants hidden underneath from cabbage worm, leaf minor and carrot rust fly. To control slugs and snails place slug bait in slug ‘hotels’. Surround vulnerable plants with strips of copper or copper mesh. Click here for more on slugs & snail control. For more on insects, click here. Prevent cabbage butterflies from depositing their eggs with a cloche. A cloche protects veggie plants from carrot rust fly, leaf minor and caterpillars. Fertile soil improves the taste of veggies and fruits. Compost is the best! It feeds the soil and plants and is free if you have enough compost bins! I don’t and I have 3, so I buy bags of it. Composted and well-rotted animal manures also contain nutrients and help bulk up soils. Steer, cow, sheep and llama are good. Be aware that compost and all manures should not be hot, steaming or smelly. If they are don’t apply to the garden as the decomposition process has not finished. Allow the pile to cool and stop smelling than add it to garden beds. Organic fertilizers such as kelp, fish etc., provide nutrients, essential trace elements and amino acids. Synthetic fertilizers are suitable when plants are really hungry and are a quick fix, but don’t use them on a regular basis as they destroy the integrity of the soil and the soil organisms. Synthetics also burn up the organic matter in the soil, which is a bad thing. I use slow release synthetics on container grown plants as it reduces my maintenance, keeps them fed for at least 3 months and doesn’t harm the soil organisms because the soil is potting soil, not garden soil. To learn more about Fertilizing & Feeding Plants click here. To learn about Organic Options click here. Learn what the numbers mean click here. Mulch. As mulch breaks down, it converts into food for plants. Lay a 3 inch layer of wood chips, fallen leaves and other organic matter. Mulch also protects the soil from the elements, prevents weeds, reduces erosion, insulates soil from temperature extremes and when it decomposes it feeds plants. And keep leaf litter and other organic debris on garden beds as they also breakdown to improve soil nutrition. For more on mulch click here. Van Eyk tulips, white narcissus ‘Thalia’, pink dangling clusters of the flowering currant (Ribes sanguineum), white star magnolia (M. stellata), pink bleeding hearts (Lamprocapnos spectabilis), yellow buttercup flowers are marsh marigolds (Caltha palustris), small yellow flowers are kale, deep maroon flowers lenten rose (Helleborus), drooping green leaves of the Solomon seal (Polygonatum biflorum), Delft blue hyacinth and Bob’s Blue rhododendron (lower left). The intricate and unusual flowers of the bleeding heart are aptly named. Fern-like foliage complement the flower laden arching branches. 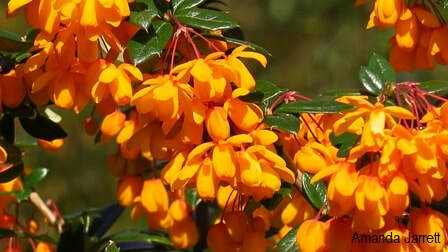 Other common names include lyre flower and lady-in-a-bath. The white version 'Alba' is just as beautiful as it's pink relative. Weather permitting, they flower lasts through to the end of May. 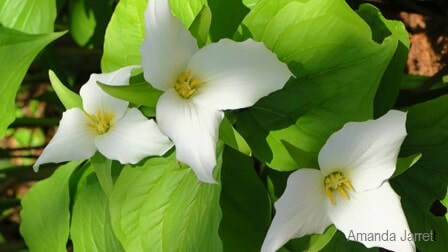 They prefer moist, fertile soil with a layer of mulch in partial shade. Flowers: April to May, showy pink heart shaped flowers with a white drop-shaped petal in the middle form along the undersides of arching stems. Comments: This easy to grow, low maintenance herbaceous perennial provides grace, beauty and drama with its delicate form and decorative neatly arranged heart shaped flowers. They dangle like earrings along the arching stems above a lacy mass of soft green, fern-like foliage. As the years pass the plant will become wider and will self-seed if the conditions are suitable. Much to the surprise of many gardeners, this plant dies down in summer (spring ephemeral). It’s not dead. It will regrow the following spring. The hotter and dryer the summer, the quicker it will go into dormancy. To prolong its spectacular show, apply a 3 inch layer of a organic mulch and keep it watered during dry spells. Prefers a cool climate and moist, organic rich soils. Bleeding hearts benefit from a yearly application of a couple of inches of compost, composted manure or other organic matter mixed into the soil. A 3 inch layer of an organic mulch is essential for bleeding hearts to hold moisture in the soil. Gold Heart boasts chartreuse foliage, which contrast nicely with the many pink flowers. 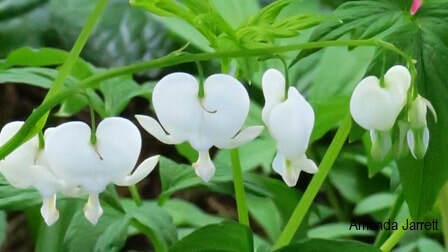 The white bleeding heart is pure white and is just as easy to grow as the pink variety. 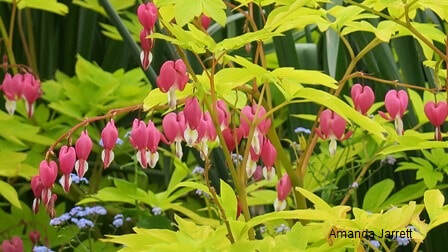 Golden Parade tulips provide a splendid background for the lovely flowering branches of the bleeding heart.